May 10, 2016, 3:54 p.m.
For decades leading presidential candidates have broadly agreed on trade issues, but 2016 is different: this year the leading candidates are critical of free trade. Donald Trump has made opposition to free trade a key plank of his campaign, but even Hillary Clinton has come out against the negotiated Trans-Pacific Partnership (TPP). The TPP is a free trade agreement between the United States and 11 other countries on the Pacific and represents an attempt to restart a global process to reduce trade barriers which has stalled in recent years as voters turn against free trade deals. 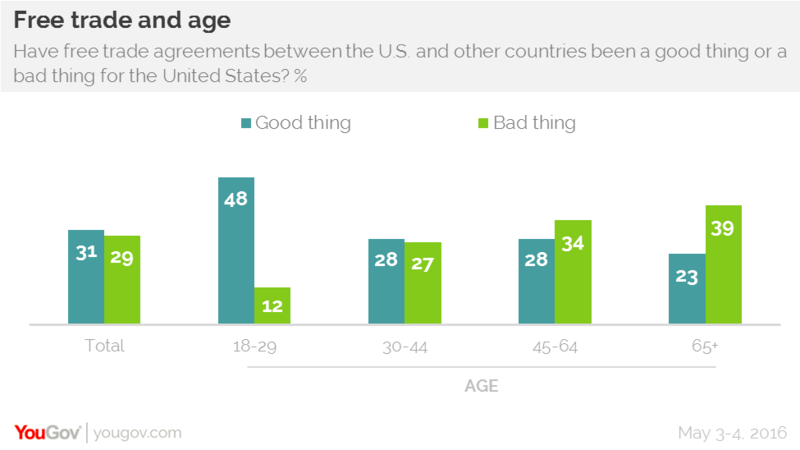 YouGov&apos;s latest research shows that Americans under the age of 30 are one of the only groups to generally say that free trade has been a good thing for the United States. 48% of under-30s say that free trade has been good for the country, something only 31% of all Americans agree with. Free trade has been a fixture of this age group&apos;s existence, however, as even the oldest would have only been seven years old when North American Free Trade Agreement (NAFTA) entered into force. The oldest Americans, those aged over 65, are the most hostile to free trade (39% to 23%). Americans generally have negative views of the impact of free trade on most specific aspects of trade, except prices. Americans narrowly tend to say that free trade has resulted in lower (32%) prices rather than higher (27%) prices, but Americans widely say that free trade has been bad for workers (45%), the environment (36%) and the quality of products available (50%).